Holiday Harbor is a small waterfront community, featuring a mix of new builds and older ranch homes as well as some vacant lots. A West of the Trail neighborhood, this community is located off Little Sarasota Bay adjacent south of Southpointe Shores and wedged behind the Hidden Harbor Marina on the South Tamiami Trail. These choice Sarasota homes for sale are those directly located either bayfront or fronting a canal to the Hidden Harbor Marina. Typically, these residences are high-end homes of more recent construction priced in the million-dollar range. Properties off the water are offered in easier price points, especially those older Florida ranch-style Holiday Harbor dwellings constructed in the 1960s and the 1970s. Although it is a waterfront community, Holiday Harbor is notably within an elevated zone. There are no deed restrictions too in this property as well as no HOA fees for its residents. Legacy Builders of the West Coast is constructing new homes in Holiday Harbor’s last few remaining vacant lots. A home model that it built in this community and entered in the 2018 Sarasota Manatee Parade of Homes was sold May of this year. Priced at close to $1.4 million, this residence features three bedrooms, two baths and a half-bath within its floor area measuring 2,986 square feet. Legacy Builders is also offering three other waterfront home and lot packages at Holiday Harbor at prices starting from $999,000. Vacant lots in Holiday Harbor are typically parcels measuring about 7,400 square feet in 50 × 150-foot dimensions, with their pricing in the $400s. Like home-and-lot packages in the community, these home sites can move quickly on the market. For one thing, lot buyers can choose their own builder, as there are no deed restrictions at Holiday Harbor. 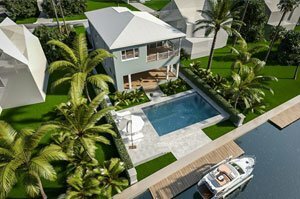 Aside from the reasonable pricing of its residences, this community corners a prime West of the Trail location matching both the convenience and prestige offered in the premier properties within the neighboring Harbor Acres and those farther north at Bird Key. The property taxes that Holiday Harbor residents pay are likewise relatively lower compared with its neighboring communities. Proximity to the Hidden Harbor Marina is one huge plus too particularly for Holiday Harbor residents who love boating and other activities associated with it. 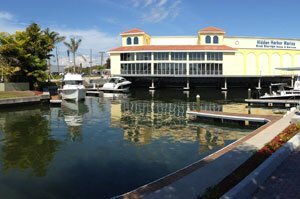 This marina cheek by jowl with the community has recently expanded its eastern canal for the convenience of its patrons and local residents. 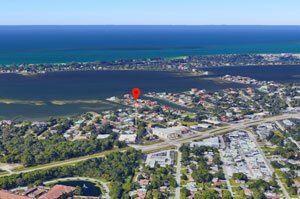 Some of the more popular shopping and dining venues in South Sarasota are within easy reach as well from Holiday Harbor. Just a short distance south of it is a slew of retail outlets in the Westfield Sarasota Square Mall on the eastern flank of the South Tamiami Trail. Recreational facilities, including the AMC movie house and the Potter Park YMCA, are likewise within this locality. More life and leisure activities could easily be enjoyed for locals opting for memberships at the nearby golf and country clubs which have continuously helped prop up demand for Sarasota homes for sale. These sports and creational centers include TPC Prestancia on Palmer Ranch typifying the varied come-ons for those living in Holiday Harbor. Below are the current real estate listings available at Holiday Harbor.